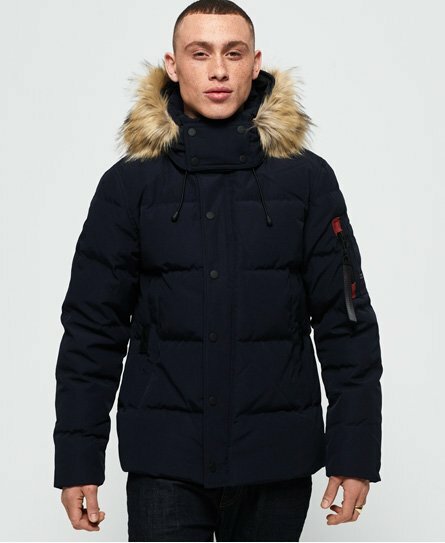 Superdry men’s premium roamer down jacket. Prepare for cooler temperatures this season wearing the roamer down jacket. This jacket has a 90/10 premium duck down fill and low fill power rating. This jacket features a hood with bungee adjusters and faux fur trim, a single zip and popper fastening, ribbed cuffs, two external zip and popper pockets and one internal popper pocket. For the finishing touches, this jacket has been decorated with a zip pocket and a Superdry patch, as well as Superdry banded zip pull.